On 2nd January 2013, to combat the increasing risk that falsified medicines reach patients, the Falsified Medicines Directive (Directive 2011/62/EC) was published. This European Union Directive aims to prevent the entry into the legal supply chain of falsified medicinal products. On 9th February 2016, the Commission Delegated Regulation (EU) 2016/161 was published, which sets out detailed rules for new safety features to appear on the packaging of medicinal products intended for human use. What is the National Medicines Verification System? How do I register with SecurMed? What are the FMD requirements from 9th February 2019? Which medicines need to be authenticated? What happens when the barcode is scanned? What if we dispense and decommission a medicine, but the patient doesn’t return to collect it? When do we scan a medicine? What do we do about split packs? How will the system deal with product recalls? How will the system deal with out-of-date medicines? What happens if a potential falsified medicine is detected? What happens if a product does not have a 2D barcode? How will Brexit affect the Falsified Medicines Directive? The UK’s National Medicines Verification System is the UK FMD system. It is provided by SecurMed UK (the National Medicines Verification Organisation). SecurMed UK comprises bodies representing manufacturers, importers, wholesalers and pharmacies; community pharmacy is represented jointly by the National Pharmacy Association and the Company Chemists’ Association. Each community pharmacy in the UK will need to connect to the SecurMed UK system so that they can comply with the Falsified Medicines Directive. The process of identifying legitimate pharmacies and granting them an account to connect is known as registration or “on-boarding”. This can’t be done until pharmacy contractors have decided which FMD IT system they will be using. Once pharmacy contractors are ready to register with SecurMed UK they should visit https://www.securmed.org.uk/register/end-user-registration/ to register. change the status of the pack in the UK’s National Medicines Verification System from “active” to “inactive—supplied”. This involves scanning the 2D barcode on each pack and communicating with the National Medicine Verification System (NMVS). Almost all prescription-only medicines, including generics, have to be authenticated; the exceptions include specials and several products which community pharmacies are unlikely to dispense. Non-prescription medicines do not need to be authenticated unless specified; the only OTC product currently specified is omeprazole. When the barcode is scanned, the unique identifier is checked in the UK hub to see if it is a valid serial number and if it is marked as previously dispensed, recalled or expired; this is known as verifying the pack. If the medicine is to be supplied to the patient, the system will then send another message to the UK hub to change the status of the product to “Inactive – decommissioned”. This process is known as decommissioning and it prevents any other pack with the same unique identifier from being authenticated – duplication of packs being a sign that falsification might have occurred. During dispensing, there will also be a check that the pack still has an intact anti-tampering device. medicines are collected by the patient. This will vary from pharmacy to pharmacy, depending on what best suits the workflow of the pharmacy and how the FMD software system has been designed; it can be when preparing a prescription or at handover to the patient, but the decommissioning of the product should normally occur at the time of handing the product to the patient, as this avoids problems related to the ten-day rule. When you part-dispense a medicine from a pack, you should decommission the pack when part of it is first supplied to a patient. The next time you dispense from this part-pack, you do not need to authenticate it again. However, since you are not scanning the pack on subsequent dispensings, you will not be alerted to recalls or expired medicines, so this will need to be checked manually. If a medicine is recalled, the manufacturer or parallel distributor will update the system, marking the relevant batch numbers as being recalled. If a pharmacy scans the barcode of a recalled medicine, the system will indicate that the product has been recalled. The 2D barcode contains the expiry date of the product. If you attempt to dispense the product after the expiry date has passed, the system will alert you to the fact that the medicine has expired. You will get a message to say the medicine has already been marked as “inactive – supplied” and it is therefore a suspected falsified medicine. If this happens, you will need to contact the MHRA and the supplier of the product. You may also want to verify any other packs of the same product which you have in stock. 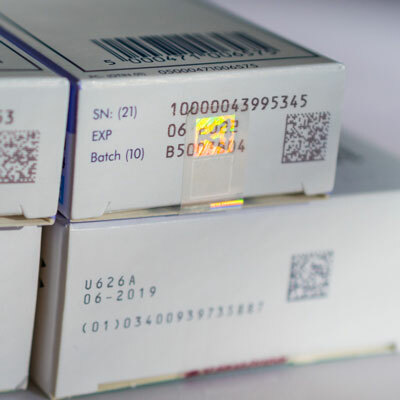 In the first couple of years following implementation of FMD, there will be many medicines in the supply chain, in both wholesale and pharmacies, that are not FMD-compliant and do not have a 2D barcode. These medicines can continue to be dispensed until such supplies are exhausted or the items reach their expiry date. Some products may have a 2D barcode, but their details are not contained within the UK hub, as they were released into the market before the start of FMD. The FMD came into effect from 9th February 2019, but the full implementation of FMD may depend on the UK’s future relationship with the EU. Continued access to the EU FMD hub will depend on the future relationship between the UK and the EU. Access is likely to continue during the transition period, and if the UK government realises its aim of a close alignment on medicines policy within the Brexit agreement, it will continue after 2020 too.